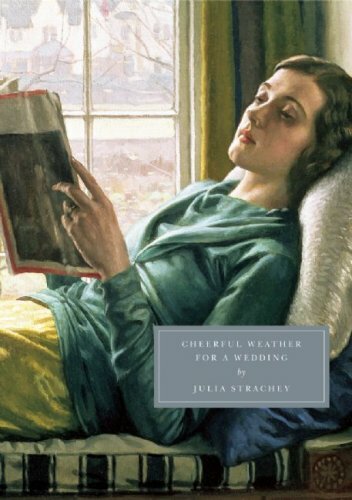 When I picked up Cheerful Weather for the Wedding by Julia Strachey for the first time three years ago, I did so knowing that it is one of those Persephone titles that readers are divided on. Many loathe it, others adore it. I am firmly in the camp of the adorers. I was charmed by it on that first reading and rereading it this month for Simon’s readalong I found it no less wonderful or humourous. The humour is unapologetically black and the characters – except for a few supporting ones – fundamentally unlikeable. On her wedding day, bride Dolly Thatcham is hiding upstairs in her bedroom with a bottle of rum while her family and friends – including Joseph, an old lover – mingle awkwardly downstairs. Kitty, Dolly’s younger sister who is perfectly, horribly, awkwardly seventeen, and their young cousins Tom and Robert, who spend the whole day squabbling over a pair of loud and offensive socks, are the only characters who managed to win any sympathy from me. Everyone else is awful, which is why I can laugh at their sufferings and delight in doing so. The genius of the book is its determined lack of sentimentality: no one is treated tenderly, no romance given special treatment or sympathy. Dolly is at the centre of a love triangle, about to marry Owen, a dull member of the Diplomatic Service, but driving Joseph, a student she had spent the previous summer going out with, almost literally mad with his unprofessed love for her. And each of them is horrifically unappealing in his or her own way. But that is what makes the book work. We see everyone at their absolute worst, hysterical and brittle from the stress of the wedding, and Strachey turns that into comedy. The first time I read this, I was struck by how it felt much more like a play than a novel (or, given its length, a novella). Strachey never delves into the inner lives of her characters or even past events: everything is on the surface. We are privy to exchanges of wonderful dialogue and are given rich descriptions of the surroundings, but that is it. It was those descriptions that struck me the most on this reading, especially Strachey’s exaggerated use of colour, which she uses to make her characters appear almost grotesque: Kitty disgustingly observes that Owen’s skin appears lilac in a certain light; Dolly makes her face up with a “corn-coloured powder”; and, most strikingly, Mrs Thatcham’s eyes are described as orange. These are not gentle descriptions but vivid, frequently repulsive ones. As other bloggers have joined the discussion about this book as part of Simon’s readalong, it has been interesting to see how they reacted to Joseph’s revelation about Dolly in the final scene. Some seem to take his word as fact but to me that seems problematic for a number of reasons (least of which being that the math doesn’t seem to work). Joseph spends much of the book in a state of hysterical anticipation, building up to a confrontation with Dolly. When it doesn’t materialize, he is disappointed, relieved, and still basically emotionally unhinged and desperate for attention. All this leads to a dramatic tirade against Dolly’s mother, climaxing with some shocking information about her daughter that may or may not be true. Personally, I am inclined to question it. There is not one single thing that marks Joseph as a reliable source of information, especially given how he immediately enhances his facts once he begins sharing them and sees how his audience is reacting. It was interesting to reread this again after a couple of years. There was something electric about my first reaction to the book – my love for it was immediate and energizing and very surprising – that was lacking this time but I gained a new appreciation for details I had missed. The experience was different – rereading always is – but it did not alter Cheerful Weather for the Wedding’s position as one of my favourite Persephone books and certainly, in my opinion, the funniest. We’ve had very similar experiences on re-reading – not having the surprise at its marvellous, quirky tone means we can appreciate the details, doesn’t it? I wondered about those orange eyes. Perhaps they are a (not particularly subtle) hint of the ‘unnaturalness’ of the situation (this is done with unseasonal flowers, for instance – but obviously with different significance! – at the start of Wilde’s Dorian Gray). What did you make of the hands like raw meat chops? Ew. And Mrs T’s tiny feet, mentioned at least twice I think. 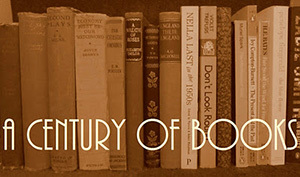 We’re barely scratching the surface of this weird little book! I loved it too. The hands and feet really struck me too, both quite repellent – and with the feet that’s odd as small feet are normally an attractive feature. I agree with Claire about the timeline for the babies making it quite impossible for them to exist, but even without the chronology I think they’re just an hysterical addition to Joseph’s rant. It’s a fascinating book and one I have really mixed feelings about. Hard to like, harder to stop thinking about, and I can’t say I dislike it either. I feel almost like I read a different text from others taking part but I’ve really enjoyed seeing which details everyone has picked out to discuss. 🙂 I hadn’t thought of the theatricality of it before despite it being made into a film but I suspect I’ve liked it much more as a stage production. I too wonder about the reliability of Joseph’s disclosure. If true, it puts things on a whole different level – moves the tale from dark farce to something much blacker in my very personal opinion – but *is* it true? Or just an attention-getting device? Either seems possible. Could be true; would explain the bottle of rum & Dolly’s behaviour… Or not. I keep seeing the scenes almost as painted images. Was Strachey a painter, I wonder? Or intersted in modern art? Her colour descriptions seem frequently bizarre, but if one thinks of the “realistic” works of the modernist painters of the time it was written then the comparisons are apt. Such a visual novella. Am about to read it again; will be interesting to see what I pick up on the second time, now that there are no more surprises to distract me. for me it felt like re-reading, because I saw the movie adaptation first. I agree with you, the black humour and the caustic remarks are what makes this book great – the harsh light of reality is what it is about!